The warm nostalgic feeling of vintage Halloween permeates through the new Pumpkin Pail Collection from Horror Decor, a seriously sweet set of new seasonal releases, featuring a gang of wicked cool trick or treaters presented in various scenes that distinctively capture the best of all holidays. For the new Pumpkin Pail Collection, Horror Decor worked with artists Marc Vuletich and Jody Bonham, who brought six unique visions of Halloween night to life in a variety of candles, wax melts, pillows, tote bags, kitchen pot holders, a flag, and the company’s first ever enamel pin. 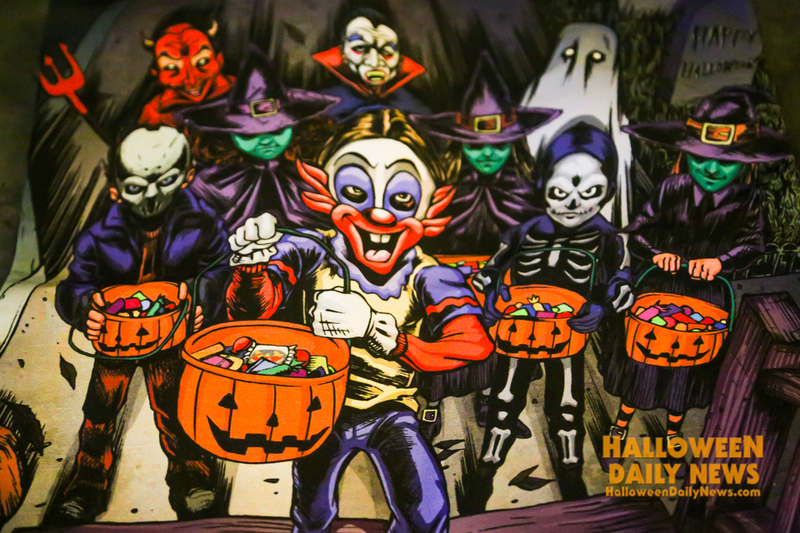 The group of highly detailed trick or treaters that are pictured throughout the various items each has his or her own personality, all a bit mischievous in appearance and clearly as much into the tricks of our favorite day as the treats. There’s a little devil, a vampire, and a creepy clown hanging out under a low hanging tree on a late fall day, as pictured on the ultimate autumn pot holder we got for our kitchen. We also got the pumpkin scented wax melts, which feature a very psycho killer-esque hockey masked kid with a sharp knife as its related artwork. Other available scents include candy apple, candy pail, apple cider, and fall leaves. Our apple cider scented candle creates an aroma of autumn nirvana, featuring art that depicts a gathering of three wicked witches. One of my favorite items in the Pumpkin Pail Collection, and one that will have a year-round place in our living room, is the pillow, ours of which features a lonely ghost holding an apple with razor blades sticking out of it, who really reminds me of Sam from the holiday classic Trick ‘r Treat. The enamel pin features a sinister “pumpkin pail,” but instead of candy treats, it’s overflowing with body parts in a pool of fresh blood. And our handy black tote bag features the whole gang of kids, adding a grim grinning skeleton to the group, with their pumpkin pails held out as if to say “trick or treat”. The Pumpkin Pail Collection has all the vintage throwback appeal of the Ben Cooper costumes of our youth spiked with a dark strain of wicked fun that flows through each of these amazing images, paired with their perfectly complimentary scents in the candles and waxes. I can definitely recommend each of these products to help embed your home with the Halloween spirit all season long. You can see the full collection and order yours here, but you better hurry and place your order by this Saturday, Oct. 7 to receive your treats by Halloween, because all of these items are handmade. Get a closeup look at the Pumpkin Pail Collection in our video and photo gallery below!